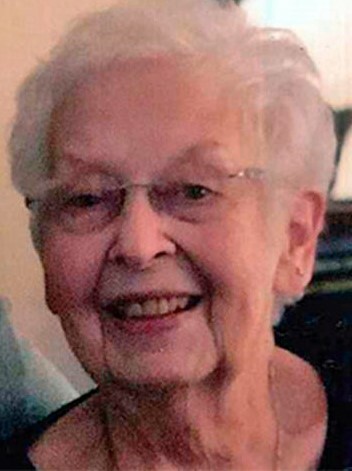 Carrie Ann Donnahue, 86, died Thursday, March 21, 2019 at her home surrounded by her family. She was born in Duluth on February 17, 1933 to Ethel and George Parr. She was a graduate of Denfeld High School. Carrie married John Donnahue on a snowy December 2, 1950 at St. Clements Catholic Church, Duluth. Carrie was a loving wife and mother who gave birth to their first child while her husband Jack served in the Army during the Korea Conflict. In the years that followed, this quiet strength and selflessness guided her faith and her love of family. She enjoyed family dinners, watching Vikings games, playing bingo and card games with life long friends. But most of all, she loved to dance, especially to “The Stroll”, a family tradition at every special occasion. Carrie was preceded in death by her husband, parents and brother, Michael. She is survived by her daughter, Caleen “Muffy” (John) Kalenowski; sons, Michael (Jackie) Donnahue and Kelly J. Donnahue all of Duluth; grandchildren, Connor and Keegan Kalenowski, Stacy (Willy) Thompson and Aaron Donnahue, John Donnahue and Brady (Justin) Schwartz; great granddaughters, Alexis and McKenzie Thompson and third great grandchild due in November; brothers, Russell Parr (Vickie Norrell) Duluth, Roy (Sharen) Parr, Reno, NV, and several nieces and nephews. Visitation Wednesday 5:00 – 7:00 with Rosary at 6:30 PM at Williams-Lobermeier-Boettcher Funeral Home, 3208 West 3rd St., Duluth. Visitation continues from 10:00 until the 11:00 AM Mass of Christian Burial Thursday, March 28, 2019 at Holy Family Catholic Church 2430 W. 3rd St., Duluth. Rev Fr Ryan Moravitz officiating. Entombment at Sunrise Cemetery.